After weeks of Light Waves and Crystalline/Christed Consciousness flooding our evolving bodies and planet (both being referred to as “Planetary Bodies”), powerful cleansing processes, powerful integration phases, which continue to increase as we move further into our Photonic Age of Existence, we’ve now entered into increased StarGate Alignment and Advanced Rapid DNA Enhancements again. These are focused on activating all Higher Intelligent Life Forms to come further online with our Crystalline Grid Matrix Programs here to evolve all on this planet earth and further contribute to Galactic/Solar System existence within a Multi-Dimensional Matrix System replacing the old “Human Experience” Matrix programs of unconsciousness, amnesia and forgetting through incarnation here. Walk-ins incarnated differently than birthing incarnations, therefore the experiences are a bit different, yet for the same purposes for bringing humanity through to a whole new existence here. All matter brought to life to thrive, flourish and experience infinite abundance, there is a death/dying phase that must occur in order for evolution (returning) to occur. These death cycles will be in many forms as well. Physically, emotionally, mentally and with whole body structures, where life cannot be sustained because HIGHER INTELLIGENCE LIGHT of each’s Soul/Star Systems are unable to integrate fully, which IS the re-coding process that brings all over (transitioning phases) from Old Earth to NEW. Each’s cellular body is working hard, where unconsciousness was strong/deep. Each cell must continually activate and re-code itself and be able to communicate easily, without interference, resistance or blocks. The typical sleeping human body stored unconsciousness in every cell/part, which built up over the separation of time, therefore it takes “time” for the deconstruction/re-coding process to occur to REVERSE the POLARITY of all held and create a whole new ZERO POINT RANGE, which tells every body part, every organ, the brain, the heart, the skin, the glands, the eyes, the senses, the neural pathways & network system what to do, how to function. At the center of this is your nervous system, your heart and brain. These appear to undergo the vaster amount of work, because these are the ones that appear to affect your functioning more, yet when in fact, it’s every organ/cell of your body that has to work cohesively/in unison for your body to function at it’s highest capability for pristine. 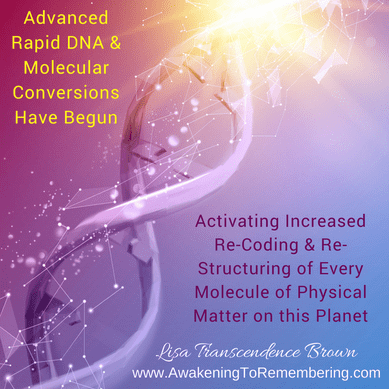 Every part of your body goes through immense re-writing/re-coding/re-working itself, depending on your current part of this immense evolutionary process that continually brings all into higher dimensional existence and out of lower dimensional/density existence now. These higher-dimensional-intelligence codes resolve vibrational mis-matches faster, making all visible faster/instantly, increasing the rapid release of all unconscious realities that can no longer align with the overall frequency of our Increased Ascension Earth’s Trajectory. The strength at which each experiences this is relative to conscious/unconscious states/programs housed within the physical body and what’s necessary to move each into a much higher vibrational existence now. Each is gaining greater capacity to CARE on a much deeper level than ever before. This CARING is for yourself, therefore allowing you to truly CARE about each other, to truly care about your Earth, to truly CARE about UNITY, LOVE, RESPECT, KINDNESS, INTEGRITY through ACTIONS of how you TREAT each other, the Earth and your Selves. All higher light frequencies “shine the light” on all that is UNCONSCIOUS and not PURE for each to SEE it and physically experience it, if this is what it takes to open/activate each’s Higher-Heart-Soul-Mind more. Those old focal points that were distractions will become “loud” and for the really strong ones each was holding onto out of resistance/judgment/fear, these are often “removed” so that inward focus and purification/cleansing can easier occur. This multi-collective awakening means a substantial increase in collective experiences of REALities being re-worked. This re-working process is called re-alignment with each’s SOUL, instead of with the ego-human self. REALities are created out of ENERGY and VIBRATIONAL FREQUENCIES and lower dimensional/density earth was created out of the ENERGY of unconsciousness (Separation from Self as SOURCE/Pure Source Light), which is the lowest possible cellular vibration there is. These unconscious mentalities/beliefs are what is being “broken down/through” to awaken each to a whole new existence that does not derive from separation/fear/survival instincts of “self-preservation” first. Unconscious Earth operated by MAINTAINING fear-based programs/programming, where each “lost/forgot” what PURE EXISTENCE is. By each maintaining INSISTENCE of what REALity is, instead of truly opening up fully to honor, listen, respect, care, support, have compassion, hold kindness and actually contribute in a way that is beneficial to the GREATER Good, the whole, the bigger picture and each other as important, loved and appreciated through gratitude and a love that must be REMEMBERED to understand. This REMEMBERING is a process that can only be done through the heart/higher heart and observing higher consciousness mind self. This REMEMBERING RETURNS each to an existence that is a compilation of all existences merged into this one right here. Each existence also had distortions that must be purified and cleansed. Each aspect does too. These processes and gateways move each further through this. By choosing/deciding/agreeing to ENTER the REALMS OF AMNESIA, you agreed to forget, you agreed to disconnect so much that many are “struggling” to “find their way back”. (Technically this is not true, as everything is occurring exactly as it’s supposed to/meant to be, all in Divine Timing, on the “schedule” that your own Soul pre-determined before every choosing this planet as a destination (Point of Origin) for your awakening/service work/experiences here. To Exit the Matrix/Realms of Amnesia, certain events must occur, to shake/startle/collapse each of your old belief systems that kept you in those dimensional timelines that no longer have any support for sustaining, which is why many are feeling/experiencing “urgency” in their own lives. This URGENCY is your own Wake-Up Call (Clarion Call/Message) from your own SOUL. IF your realities are not full of JOY, LOVE, INSPIRED, EASY & SIMPLE and able to align FOR YOU with great ease, then YOU are HOLDING ON and allowing the perpetuating of old programs in your own etheric/energetic/physical reality here. Your E-motions (Energy in Motion) are the release of old victim/dis-empowered states that you created/allowed before, that you believed, due to a program/fear located in your Root Chakra/Core/Root Systems throughout your body and your “Shaking Cells” are your LightBody (Cells speeding up), your Soul Body activating and “bumping into/triggering/activating” those programs wherever they are in your body to purify/release/cleanse/clear, which also affect your nervous system/breathing/vision/hearing and more. Your whole body/system is affected more and more and more, because it’s ‘OUT OF TUNE’ and those old unconscious programs hold a vibrational frequency that can no longer “live” in your higher dimensional body trying to bring you ONLINE and OVER TO THE OTHER SIDE, where UNITY CONSCIOUSNESS LOVE rules your entire reality world. Your cells start to vibrate and move inside of you, they start communicating as your Intelligent DNA transmits NEW MESSAGES throughout you for how to re-work/re-code/re-wire itself electrically, creating a whole new networking system inside of you that communicates new coded messages on how your body needs to be re-worked… yet your unconscious human cannot “hear” or “see” this, only your fully in-tune present Expanded Conscious Quantum Soul Self can, which does understand and KNOW what your human cannot. You are the one that CHOOSES which one you allow to be present in every moment here, which therefore DICTATES your entire experience as well. The “problem” for many (not really, yet I need a word to describe), is that these “invisible realities” are not real yet, not believable and not important enough to honor/respect/allow. They do not “fit into” “what reality is” or what is perceived as important, and everything else/other things are put first, because of the “strong hold” of what is important/needed to survive is distorted, because there is no comprehension level yet regarding “the integration of Higher Dimensional/SOLar (Soul) Light”. It’s not yet understood that integration is HOW our lives get easier, how our lives take new shape, how infinite everything comes forth, because it’s “not tangible” and can’t be touched, soooooooooooo, in order to get the linear-minded human’s attention, THIS must TOUCH their lives BEFORE the heart/mind will OPEN to listen/respect/honor/do what makes no logical sense…. These encodments RESTRUCTURE ENTIRE REALITIES, often from scratch. They are for BUILDING ALL NEW FOUNDATIONS through UNITY and LOVE and where we are not yet open to this, our resistant, non-believing human aspect often “requires” an experience to accomplish this. Where the “soft way” doesn’t work, the alternative is a “strong way”. WE did have a bazillion opportunities to awaken/open up, yet it was not time…. now it is… for every LIVING BEING ON EARTH. If you look at this statement, then what does this tell you? What does this mean for you and what’s truly important now? While we are functioning on a multi-dimensional earth right now, the lower dimensions will dissolve, disintegration, deconstruct, dismantle and be obliterated in various ways. ALL EXPERIENCES are to OPEN THE HEART & MIND so that each’s SOUL and GALACTIC SELF can emerge fully from within and INTEGRATE INTO THE BODY, for walking physically in Heaven on Earth, so each will live out/work through all things that represent “Hell” until “Hell” is no longer a desired experience. Each’s focus, actions, each’s energy… this is what creates/supports. NO REALITY CAN FLOURISH if you do not support it, do not allow it, do not keep creating it, do not keep participating in it and KEEP IT GOING….. Your BELIEFS and MENTALITIES dictate HOW PHYSICAL MATTER TAKES FORM…. your vibrational transmission, so if you deconstruct and dismantle your own mentalities and beliefs, see the distortions yourself and HONOR YOUR EMOTIONS that are a cellular cleansing process until they are all depleted/gone (to be replaced with the PURITY OF LOVE), then the CONSTRUCTS that held those REALities collapse too. The moment you REALize your reality is your reflection of your own programming, the moment you have the CHOICE to change the VIBRATIONAL TRANSMISSION to activate a whole new program/timeline to play out for you. Your human believes the physical, instead of understanding how the physical comes into form. Your Consciousness forms matter, not the other way around. Your beliefs take shape, your actions solidify them…. only you can shift the vibration/change the reality…. AS A SOUL. Your human aspect does not have these simple capABILITIES, only your Soul/Highest Self/Aspects do. Your Soul is INFINITE and spans every dimension simultaneously. As you EVOLVE as a SOUL you re-gain the capability to do all with great ease. Your life is SIMPLE, full of love, joy and peace. You align realities, you create them…. you hold great Responsibility for your Creations, as do all others. It’s just the more unconscious one is, the less they understand/comprehend this. They fear taking their power back, they fear opening up to be seen, they fear the physical, they fear LOVE, because of immense distortions/stories that they still have going on within them. You are here to RE-EDUCATE through LOVE Consciousness, through Unity/Christed/Crystalline Consciousness, through PURITY/LeMUrian/Arcturian Consciousness, through Higher Intelligence Consciousness (Sirian/Atlantean/Lyran) and more… You are here to BE THE EXAMPLE, to be the PROOF that UNIFIED EXISTENCE is REAL and that we can all come together, work together, co-exist together through Peace, Kindness, Compassion, Consideration and more. You are here to bring forth ALL OF YOUR ASPECTS & EXISTENCES and Embody these fully, by way of clearing all distortions as they present, yet you cannot do this if you are not observing, seeing, recognizing and actually DOing highest alignment in HOW YOU LIVE YOUR LIFE…. which STARTS with you honoring you and integrating/holding this vastness from within you — all of the time (not just when it benefits you or when you want/need something). StarGates prepare to activate fully for higher timeline synchronization to occur. This is an “always occurring” process now. The influx of PURE CHRISTED/CRYSTALLINE frequencies running 24/7 now, the charging up, the density clearing, re-alignment, re-coding, re-calibrating, re-synchronizing, re-everything… we just cycling in/out/through different frequencies constantly so that the actual evolutionary process can expedite faster/more now. Your actual experience will show you which dimension you are currently in with your body, and your ability to MAINTAIN your expanded state will dictate this. What you surround yourself with (physical matter things and others) will also dictate this. Where you flood your own consciousness with all things of the absolute highest vibration there is, all things that activate/open your own hear, bring through more happiness, honor your own dreams, honor you, then you will find it easier to maneuver, because you will be honoring when your body tells you it needs to shut down/sleep/integrate, honoring how you feel, respecting/loving/showing kindness and consideration to yourself, which gives you the capability to do this for/with others too. If you allow yourself to deplete (integration with deplete to re-write your template all along the way), give all of your energy away, over compensate, try to save/fix everyone out, allow others to impose/overstep their boundaries or you keep overstepping yours, then you will find yourself experiencing realities to show you not to do this anymore. This will correlate to your physical reality, physical world abundance, physical world things, situations…. YOUR BEHAVIOR dictates the experience you have here. You are FULLY RESPONSIBLE for your own behavior, how you treat all….. where you come from (fear or unity-love) will dictate whether your reality flourishes or appears to fall apart. This collapse or falling apart is the re-structuring of your reality for you. When all of that separation energy dissipates/dissolves, then the cellular structure can take new shape. This occurs for you faster now. If you have taken an active role in integrating and being fully conscious of yourself, then you will have a much easier (and in-JOYable) experience than if you are not. This process occurs REGARDLESS of your conscious participation, for this process was pre-determined before ever incarnating/walking into the body you chose that held the DNA/Genetics necessary for your whole experience here. First your human (separation/ego/duality/unconscious one), which you must completely cleanse/clear/transcend from within, then your higher timeline ones, where you walk in HEAVEN ON EARTH, birthing yourself on NEW Earth to “learn” how to do everything all over again, from scratch, building/creating all new realities that are fully aligned with NEW EARTH PRINCIPLES, PRACTICES and UNIVERSAL COSMIC LAWS that precede everything else. As you “learn” how all works, as you start to contribute, as you open up to share, support and become an integral part of OUR NEW HUmanity, you establish your RESIDENCY on NEW EARTH, which becomes permanent as you accomplish the tasks, fulfill those roles/purposes/missions that you came here to DO, which is how you CHANGE EARTHS and no longer have to go back….